CAN-8x23 | CANopen Embedded Device with 1 or 2 I/O Expansions. Formerly I-8KCPS1/2. CANopen Embedded Device with 1 or 2 I/O Expansions. Formerly I-8KCPS1/2. CANopen is a communication protocol, based on the intelligent field bus(CAN bus). It was developed as a standardized embedded network with highly flexible configuration capabilities. It provides standardized communication objects for real-time data (Process Data Objects, PDO), configuration data (Service Data Objects, SDO), network management data (NMT message, and Error Control), and special functions (Time Stamp, Sync message, and Emergency message). CANopen is used in many application fields, such as medical equipment, off-road vehicles, maritime electronics, public transportation, and building automation. 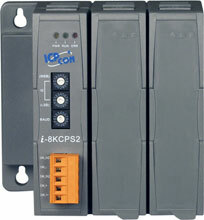 I-8KCPS1/2 main control units are specifically designed as the slave device of CANopen protocol. It follows the CANopen Spec DS-301 V4.01 and DSP-401 V2.1, and provides many features for users, such as: dynamic PDO, EMCY object, error output value, SYNC cyclic and acyclic. In order to expand I/O channel flexibility, an I-8KCPS1/2 supports 1/2 slot(s) for I/O expansion and suits with a lot of ICPDAS DI/AI/DO/AO slot modules. Users can choose DI/DO/AI/AO modules of I-87K series or I-8000 series to fit the customized practice applications. In addition, we also provide utility tool to allow users to create the EDS file dynamically. The EDS file is based on CANopen SP306 and can be compatible with different CANopen master interfaces. The application architecture is as image on the right.